Balance sheets globally tend to hold more cash today given the critical role of liquidity; managing this cash is a tough task for treasurers, who need to balance the need for liquidity against the return demanded by stakeholders. Call accounts and fixed deposits have been the traditional home for balance sheet cash. Investec Asset Management Corporate Solutions offers an equally liquid alternative with attractive returns. 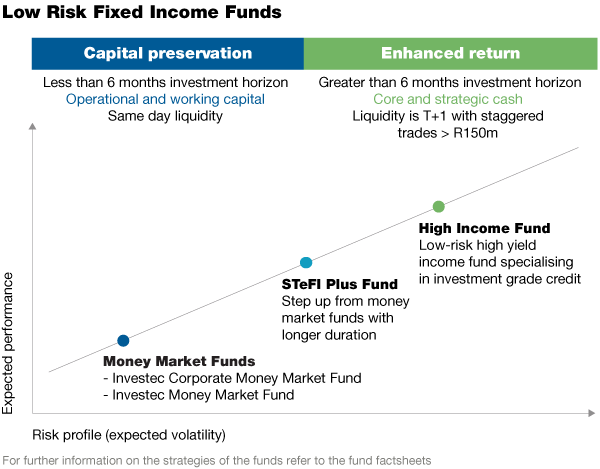 The Corporate Solutions fund range allows you to match your likely liquidity requirements more accurately, matching your internal investment mandate and safeguarding capital, while earning a proportionally better return on cash. Existing investors include JSE-listed companies, together with public sector entities and private companies. Minimum investments per fund are R20m for either of the two Money Market Funds and R10m for the STeFI Plus and High Income Funds.